THE CUSTOM PRODUCTS MICRO MEASURE IS OF MY OWN DESIGN. IT INCORPORATES A RELIABLE MICROMETER-ADJUSTABE BRASS MEASURING DRUM. THE MEASURE IS 100% MACHINED, MEANING NO ROUGH CASTING SURFACES, WHICH ASSURES A SMOOTH POWDER FLOW. 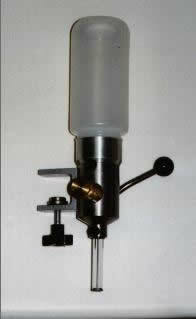 THE BOTTLE ADAPTOR/BAFFLE ASSEMBLY PROVIDES THE MOST PRACTICAL AND EFFICIENT POWDER RESERVOIR! YOU CAN CHANGE FROM ONE POWDER TO THE NEXT SIMPLY BY CHANGING BOTTLES. THE MEASURE DRUM IS GUARANTEED TO REPEAT ITSELF FROM ONE PREDETERMINED SETTING TO THE NEXT, AND CHARGES CAN BE VARIED WITHOUT CHECKING A POWDER SCALE. THE MEASURE COMES COMPLETE WITH ONE REMOVABLE POWDER BOTTLE, TWO 3" DROP TUBES (SM & LG), AND COMPLETE INSTRUCTIONS.